In 1933, Franklin D. Roosevelt was elected president of the United States by promising to end the Great Depression, which had driven the national unemployment rate up to 25% and gutted the economy. During his presidential campaign, FDR promised to lower government spending and taxes, and balance the budget. Once in office, he did the exact opposite. FDR's government spent more in an effort to create jobs and increase consumer demand. He raised taxes to fund the hike in spending, as well key government services. All of this was meant to stimulate the economy while assisting struggling American households, in order to bring the nation out of the depths of the economic depression that had begun with the 1929 stock market crash. FDR quickly realized, however, that he could not print enough money to pay for his spending program, even by increasing taxes. The Federal Reserve Act of 1914 limited the amount of money that could be printed by the government. All Federal Reserve notes (paper money) had to be backed by 40 percent gold owned by the Federal government. 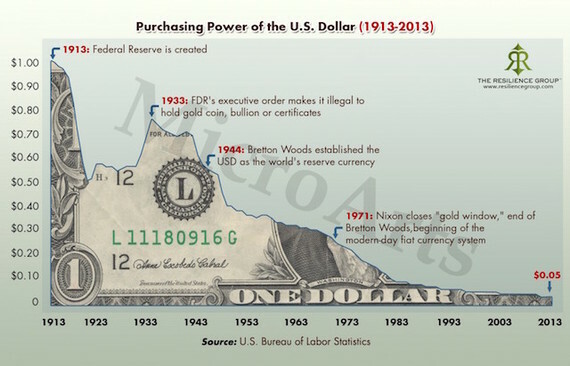 In other words, for every dollar printed, the government needed 40 cents of gold in the bank. One of FDR's first acts as president, therefore, was to declare the fact that Americans were withdrawing their gold and currency from the beleaguered banking system "a national emergency." He ordered all banks to close from March 6-9 "in order to prevent the export, hoarding, or earmarking of gold or silver coin or bullion or currency." Because he believed this action was not sufficient to prevent runs on banks and the resulting drain of gold from the system, on April 5, 1933, one month after taking office, Roosevelt used the powers granted to the president by the Trading with the Enemy Act of 1917 to make gold ownership illegal. He issued Executive Order 6102, which made gold ownership--both in coins and in bars--illegal for all Americans and punishable by up to ten years in prison. Anyone caught with gold would also have to pay a fine of twice the amount of gold that was not turned over to the Federal Reserve in exchange for paper money. 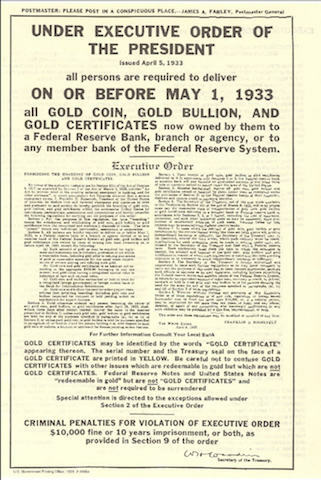 All Americans were required to turn in their gold on or before May 1, 1933 to the Federal Reserve in return for $20.67 of paper money per troy ounce. Americans who did not turn in their gold were subject to arrest on criminal charges and faced up to 10 years in federal prison. An exception was made for dentists, who could own up to 100 ounces. Proclamation 6102 also prohibited the use of gold in contracts. This was upheld by the Supreme Court on March 1935, in what were called the Gold Clause Cases. Millions of Americans waited in long lines to hand in their gold. 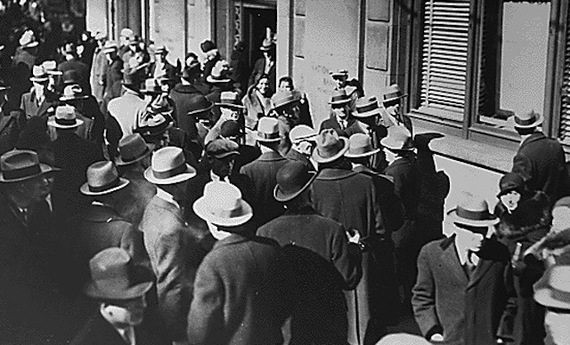 Many photos from this era are often cited as examples of people getting their money out of the banks when in fact, they were simply turning in their gold in accordance with FDR's new laws. With gold and paper money now separated, FDR was able to increase the federal deficit by issuing bonds (debt) in exchange for paper money. 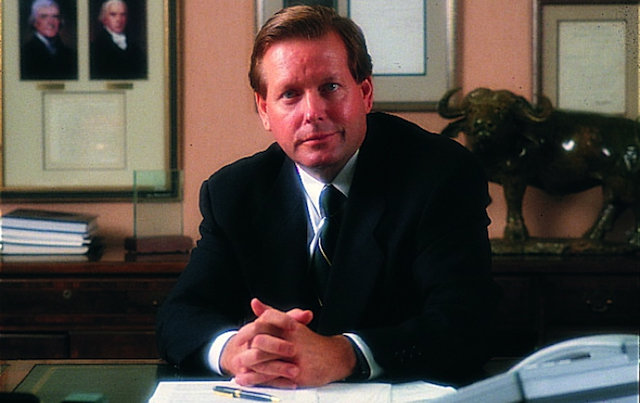 He used the paper money raised through government bond issues to pay for the many government programs he initiated as part of his New Deal program. 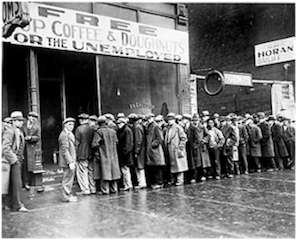 Sadly, FDR's New Deal did not end the Great Depression. Instead, in 1937, the stock market collapsed by 90 percent and unemployment soared. Then, in the 1970s, the U.S. government removed the last remaining restraint on federal government deficits. At that time, foreign countries could exchange dollars they received through international trade for gold held by the American government, at $32 per ounce. In 1971, gold started to pour out of the U.S. government's stockpile due to large deficits in both the federal budget and the trade balance. At 9 PM on August 15, 1971, President Richard Nixon gave a televised speech to the nation, announcing that he was taking the dollar off the "Gold Standard." This move enabled the dollar to float freely against other currencies, and removed the final obstacle to ballooning federal deficits and trade imbalances. The prohibition against owning gold wasn't uplifted until 1974 when President Gerald Ford-- unaware that it was a federal felony to own gold--saw sound-money advocate Jim Blanchard on TV raising a bar of gold and asking from his wheelchair: "Why can I not own this?" Ford signed proclamation Pub.L. 93-373, which legalized gold ownership and also made it legal to include gold clauses in contracts, effective 1977. Ford failed, however, to reestablish gold as a back up to government fiat or the American dollar. As a result, deficits continued to mount. Today, the U.S. federal deficit is at $19 trillion with another $70 trillion in off-balance-sheet debt, which can be triggered if certain individuals or institutions renege on debts that the Federal government has guaranteed. The purchasing power of the U.S. dollar has precipitously declined, as well. Do Today's Presidential Candidates Think the Same Way? To hear several U.S. presidential candidates remark that "we can always print more money" is disturbing. It was that line of thinking--first with FDR and later with Nixon--that instigated today's mounting deficits and the dollar's declining purchasing power. Printing more money is fraught with the very real risk of creating high rates of inflation that will destroy the purchasing power of the dollar further, and potentially damage every American's savings and the livelihoods of people living on fixed incomes such as Social Security. Could the Federal government ever move to seize gold from American citizens again? When the government nationalized gold coin and bullion nearly 80 years ago, it gave Americans less than a month to turn in their gold. It's hard to imagine this happening again, but it's important to be aware of the very real history of gold confiscation in the U.S. and to be conscious of the economic pressures that could make a president decide to take such action again. Special thanks to Naomi Shah for research contributed to this article.